More effectively manage your your accounting and bookkeeping? Looking for systems to improve how you operate your business? Our cloud accounting and bookkeeping services will do just that. We provide the knowledge, software and skilled resources. All you do is simply feed us the information. With our cloud accounting and bookkeeping services you have access 24/7, from anywhere in the world, to retrieve critical financial records and reports, manage your business and monitor any work performed by us. 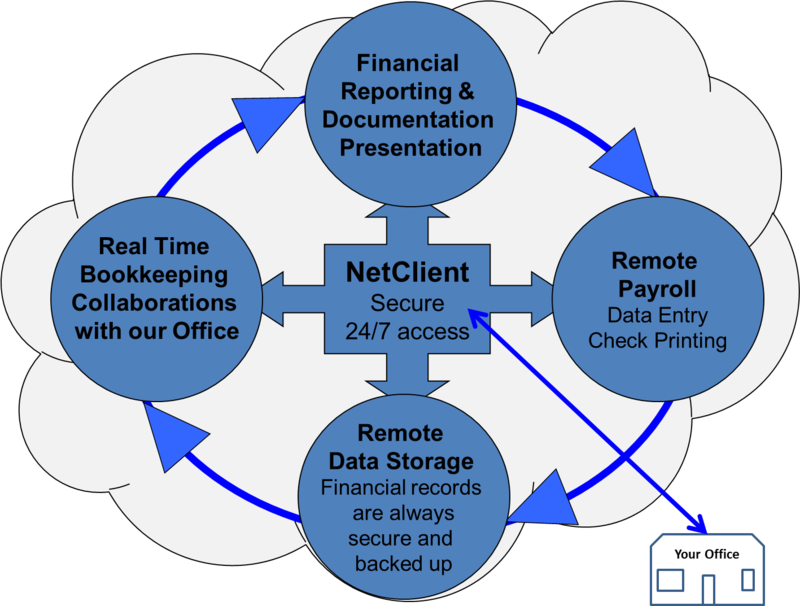 Our counting and bookkeeping software resides in the cloud. Clients login via a secure portal. From their secure portal they have access to bookkeeping software, their historical financial reports, tax returns and payroll reports. All of their data is backed up and stored on secure, remote, redundant servers. Unlike off-the shelf bookkeeping software that resides locally, on a computer or a server, our bookkeeping software resides in the cloud. Your records are safe, secure and backed up. You do not have to worry about data loss due to a hard drive crash or a virus wiping out your computer or server. All software is automatically updated. Best of all their is no additional charges or fees for any cloud accounting and bookkeeping software upgrades. We give you complete support. This includes training and technical support for our cloud accounting and bookkeeping solution. We understand how frustrating it is when you have a simple question. You try calling a support or help line for off-the-shelf bookkeeping software only to sit in a queue or be charges for the support call. Whether you simply require monthly cloud accounting and bookkeeping services, access to a virtual accountant, bank reconciliations, prepared financial statements or a fully outsourced accounting and bookkeeping department, we will customize a support package that meets your needs. Be sure to grab your FREE copy of our EBook: Five Things Every Business Owner Needs to Know About QuickBooks.